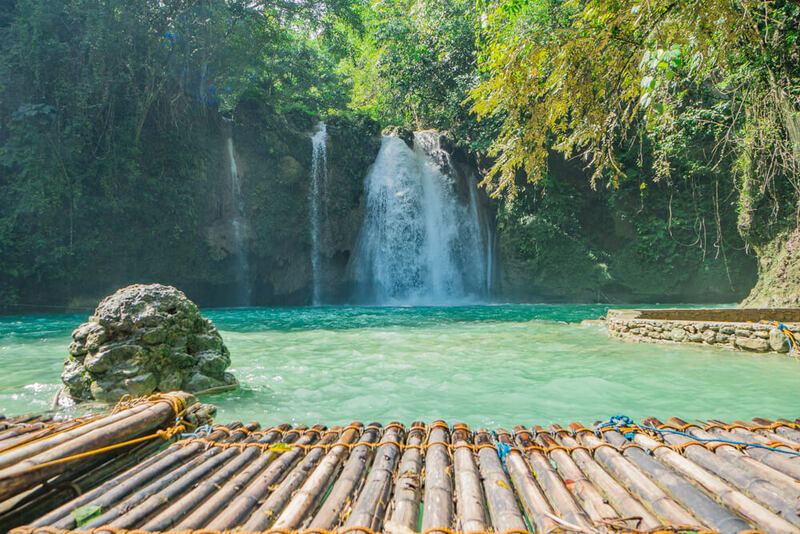 Kawasan falls on Cebu Island is one of the top attractions in the Philippines. The falls have become an Instagram hotspot as it’s possible to swim in the stunning turquoise waters. 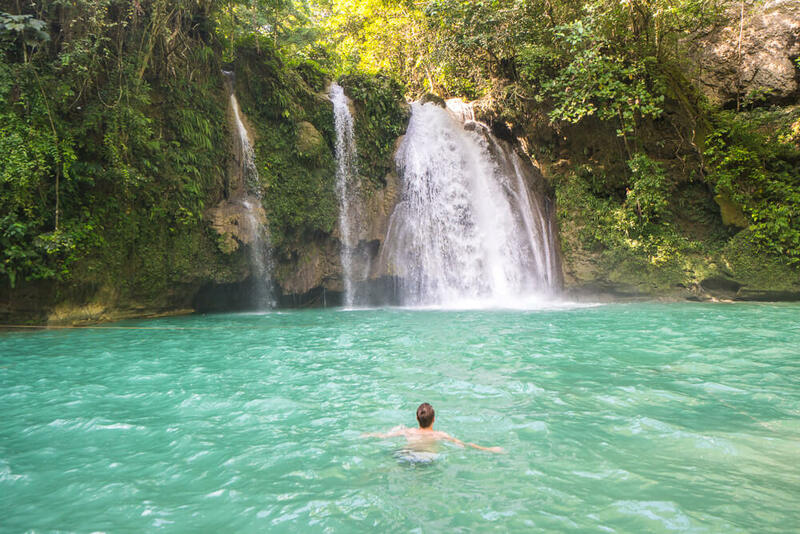 One of the most popular ways to reach Kawasan falls is on a canyoneering tour – which will take you on an adventure through the Filipino jungle before arriving at the main waterfalls. 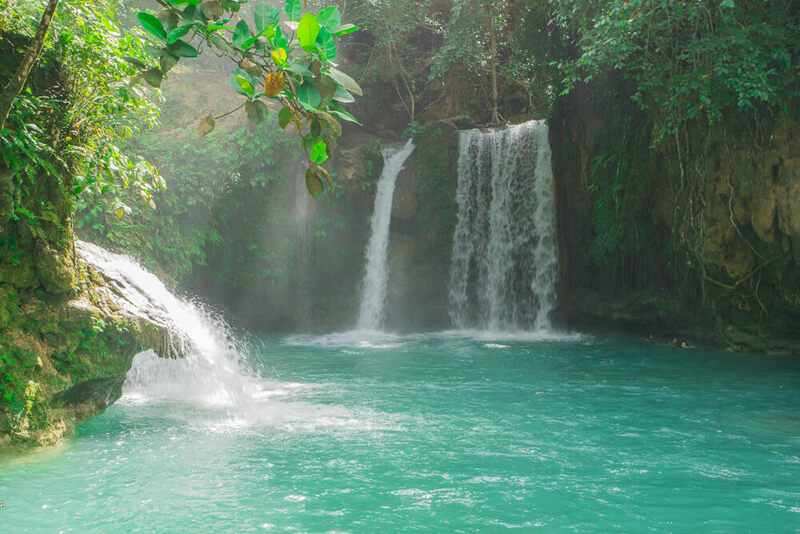 As one of the top sights on Cebu Island, Kawasan falls is an essential stop on any Philippines itinerary. 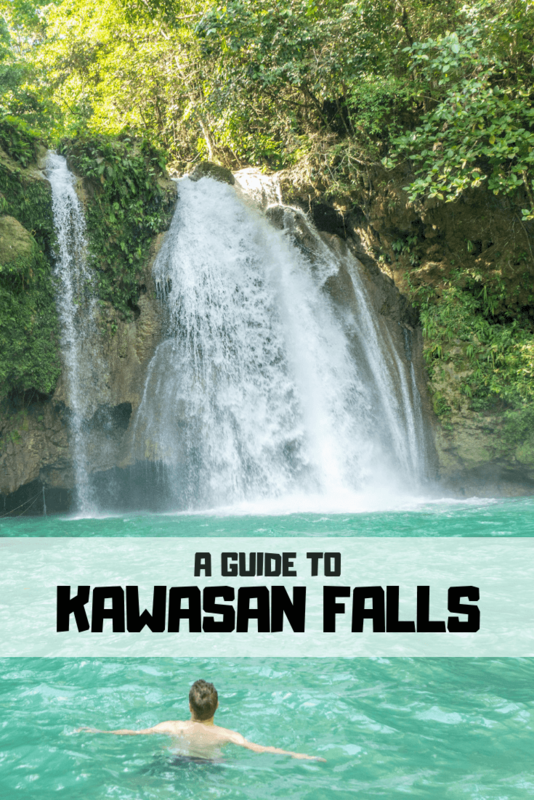 Find out everything you need to know about visiting Kawasan falls on Cebu Island, with this guide to the best known waterfall in the Philippines! Wondering what you’ll need to take on a trip to Kawasan falls? Check out our packing list for the Philippines which covers everything you need for an awesome adventure! Kawasan Falls entrance fee – 40 pesos for foreigners and 20 pesos for locals. Kawasan Falls height – 40 metres for the first and most famous waterfall. There are 3 ways to get from Moalboal to Kawasan falls. One option is to rent a scooter/bike for around 200-300 pesos and drive yourself. Make sure you know what you’re doing though; as if you don’t have a proper license your travel insurance won’t cover you in case of an accident. It’s easy enough to reach Kawasan falls without a map, as you just need to follow the main road south. Alternatively you can take a tricycle for around 600 pesos. The driver will wait for a couple of hours for the duration of your visit while you enjoy the falls, and then drive you back to Moalboal. The cheapest option is to take the bus heading south to Bato. These buses run every half an hour, cost 20 pesos per person one-way and take about 45 minutes to reach Kawasan falls. The bus stop is right outside the path leading to the waterfalls. If you’re looking for hotels near Kawasan falls, check out our guide to Moalboal as there are plenty of great places to stay there for all budgets! The cheapest way to get from Oslob to Kawasan falls is by bus. Take the bus to Bato and then change onto a bus for Badian. This should take around 2 hours and cost 100 pesos. Another option is to rent a bike in Oslob and drive there yourself, although as it’s quite a long ride you may want to avoid this. You also have the option of taking a taxi, but this will be substantially more expensive due to the distance. We recommend that you don’t stay in Oslob as the whale shark tours that operate there are not ethical as they disrupt the migratory route of the animals. Instead, stay in Moalboal to visit Kawasan falls and then add Donsol to your itinerary for an ethical whale shark encounter. As Cebu City is over 100 kilometres away from Kawasan falls, the best option is just to take the bus to Bato via Barili. This should cost 150 pesos per person and takes around 3-4 hours to reach the falls. It then costs another 150 pesos to get back from Kawasan falls to Cebu city. As Moalboal is in a much better location for getting to Kawasan falls, we recommend visiting from there. Once you’ve arrived, it’s a 15-minute walk from the road to the falls. Locals will offer to guide you for a fee, but it’s an easy path to follow so save your money. The first waterfall you reach is the most famous one at Kawasan falls. There is a restaurant next to the falls, although they charge even just for using tables – so don’t use them unless you’re happy to pay. If you want to swim in the main waterfall at Kawasan falls, you’re best off doing it as soon as you arrive as it gets extremely busy later in the day. If you continue to the left there are some stairs to head up to the second waterfall and third waterfall at Kawasan falls. These waterfalls are less busy but also allow swimming, so it’s perfect if you want a slightly more secluded spot. For the more adventurous travellers, it’s possible to go canyoneering from Kanlaob River to the Kawasan falls. This involves some cliff jumping into river pools, from up to 30 feet. It’s a great way to have even more fun on your visit to Kawasan falls, and you also get views of more of the area’s nature! It takes around 2-3 hours to make your way to the main falls on these tours. The price of canyoneering at Kawasan falls is around 1,000 pesos per person and it’s not necessary to book in advance. Instead, you can arrange a tour when you arrive at the start of the walk to the falls. Ideally, your best bet is to visit in the shoulder season, so either late December or early June. This way the falls should be relatively powerful but not too busy (although around Christmas this may not be the case). The typhoon season in the area is from July to September, so it’s best to avoid visiting at this time if possible. It’s also best to avoid the majority of the rainy season if you can, especially if you want to go canyoneering. During this time of year it’s a lot more slippery and dangerous, so the dry season is a much better time to visit. In terms of what time of day to visit, we recommend early morning. Kawasan falls is one of the most popular waterfalls in the Philippines, which means it gets extremely busy. We recommend arriving before 9am to beat the crowds, which means you should have the place to yourself for a bit! Avoid weekends and public holidays if possible as Kawasan falls is also popular with locals. Life jackets for rent – It’s possible to rent a life jacket for around 50 pesos once at the falls, so if you aren’t a confident swimmer you can still enjoy a dip! Bring your own food – The restaurant at the falls is expensive for the Philippines and will charge you just for using a table. If you’re on a budget, pack all the things you need like food and water for your visit! Bamboo rafting – It used to be possible to go on a bamboo raft ride at Kawasan falls, but this was stopped in early 2018 as tourists were being ripped off. 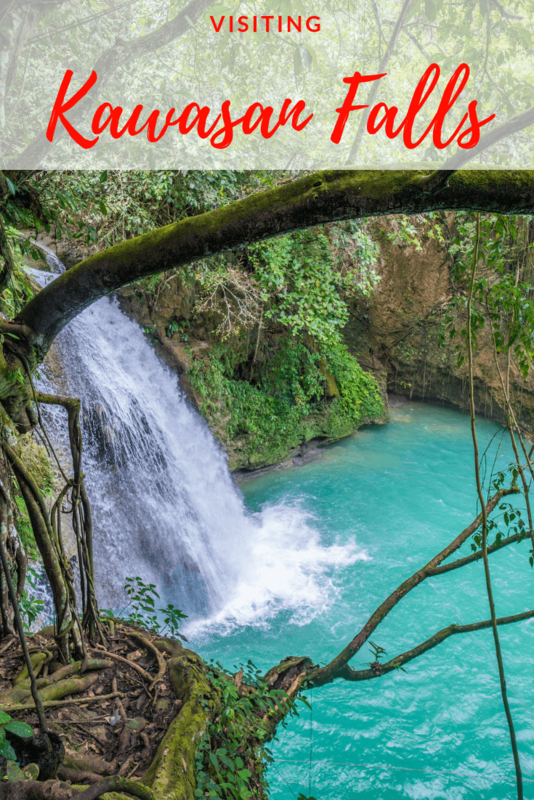 Like this guide to Kawasan falls on Cebu Island? Pin it! Wow this place looks amazing. What a paradise! Thanks – hope you get to see it for yourself soon!